One of my favorite preparedness stores, Emergency Essentials, has a new food storage analyzer on their site and graciously offered a $10 gift card for me to try it out and write up a review. Now don’t go thinking I’m so special, you have the same offer–just click the button at the bottom of this post to try it for yourself. You create a login for free if you want your input saved, otherwise you can try it out without having it save your information. I figured if I was going to go through the trouble of figuring out what I have in my storage, I should let it save my answers for me. After you login, you tell the calculator who you are storing food for (male/female and age) and it calculates how many calories per day you need to have for your family/group. Then there are pages to input the amount of certain food storage items you have in storage by category: cereals, grains and pastas; fruits and vegetables; meats and TVP; dairy items and eggs; legumes and soup mixes; desserts and gourmet mixes; cooking essentials; Mountain House; MRE’s; nutrition specific; grocery store canned foods; and add your own item. Most items had a button for more information which took you to the item page on Emergency Essentials’ site, a button to order, and a button for nutritional facts. Some had a button for recipes using that item. Each also had a box to input the number of that item you had stored and a box to input the number of that item you intended to purchase from Emergency Essentials along with the price. The cereals, grains and pastas group had items like wheat, rice, spaghetti, etc. pictured in the packages that Emergency Essentials sells them in, and you put in how many of each of those packages you have. My trouble here is that most of my food was not purchased through Emergency Essentials, so I had to estimate on some of the items. Like “spaghetti noodles” were only available in a can, but I have mine in bulk in boxes, so I had to estimate the number of cans that would equate to. They have the superpails of some items and list the weight for those, but don’t list the weight for the cans, so I really did some guessing on some products to get a number to put in their calculator. Fruits and vegetables group covered freeze dried and dehydrated fruits and vegetables, but again, only the ones that Emergency Essentials carries, so not everything I have stored could be input. The meats and TVP section had freeze dried/dehydrated products that Emergency Essentials carries. I don’t have much in this category, as most of my meats are bottled/canned or frozen. Dairy items and eggs had Emergency Essentials available powdered milks, powdered butter, powdered egg, etc. They only had instant powdered milk, so I just used that instead of digging out a can of the non-instant I have in stock to get the information off it. Legumes and soup mixes covered dry beans, lentils, and bean soup mixes. I estimated a few here also, because I have bulk items and some they didn’t list, so I just picked something close and entered my amount on that item. Desserts and gourmet mixes . . . Again, items offered for sale by Emergency Essentials, and most not something I stock. In the Cooking essentials section are items like sugar, yeast, cornstarch, baking soda, etc. I estimated here also since I usually just buy things like that at the store and not in #10 cans or superpails. How many average boxes of cornstarch equal a #10 can of cornstarch? I don’t know either. If the cans had their weight listed with them, I could have probably estimated a little closer. Mountain House section listed freeze dried Mountain House meals in pouches and cans. I do have a few of these, but they are buried deep in the food room, so I guessed at the varieties, but did enter the amount I have (or pretty close to it anyway). I did the same thing for the MRE section. We have some, but I don’t know the varieties, nor did I want to dig them out to find out. I know we have some MRE side dishes also, but didn’t even input them as I don’t have any idea how many or what kinds. I picked a couple of main dish varieties I remembered seeing in our stash and used them as the total amount instead of itemizing every variety of MRE we have. The nutrition specific section listed foods already in other groups, but you could sort them by what vitamins they were high in, etc. 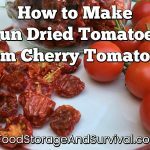 to make sure you’re getting some variety in your food storage. I skipped that section. The grocery store canned foods section listed some of the more popular canned foods you get for storage at the grocery store, including canned beans, chili, soups, fruits, etc. It did not have everything you could possibly purchase in a can from the grocery store obviously, but did have a pretty good variety. After you input your grocery store items, the last section is add your own item. In this section you can input an item you have stored, but need the label/nutritional facts for the calculator to be able to calculate the product into your storage. I didn’t put anything in here. Most of the items I have stored that weren’t already accounted for I bottled or dried myself, so I don’t have nutritional facts on them, and really, by now I didn’t want to take the time to input every can of randomness in my food room ;). Pros: This was a fun experiment and overall a good program. You could spend a lot of time on it if you wanted to input everything you have and inventory exactly how much of each item you have stored, and get a pretty good calculation of how long your food storage will last. They had a good variety of items available for easy input. Cons: If I put in that I have 10 superpails of wheat (approx 450 lbs), the calculator says I can feed my family for 74 days, but how would we do for 74 days on just wheat? It doesn’t help you put meals together, just calculates the calories/servings that you have stored. I didn’t like that it was so difficult to calculate amounts of items if I had them stored in different containers than Emergency Essentials offers. Even listing the pounds/can on items would help with this. And of course the items that I have that I had no way of figuring out how to include I just had to keep in mind as additional items on top of what the analyzer results were. Also, as a nutritional analyzer, it didn’t take things like water, medications, or other items outside of “food” items into account.